Battlefield at 2019 VA State Leadership Conf. - 4.6.2019 - Congratulations to the following FBLA students on placing at the State Leadership Conf., April 6th. Battlefield at 2019 Germanna Awards Program - 3.6.2019 - Congratulations to the following FBLA students on placing at the Germanna Region on Wednesday, March 6th. All participants have qualified to the SLC, April 5 and 6th. 12th Faculty Annual Tricycle Race Champion - 10.29.2018- The FBLA club would like to thank all of the participants who participated in the 12th Annual Faculty Tricycle Race. 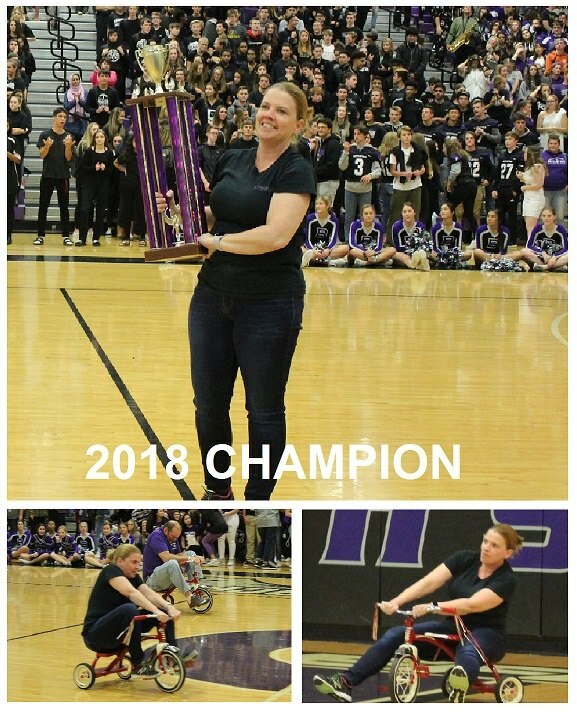 Congratulations to Stephanie Evers for being the 2018 Faculty Tricycle Race Champion – and becomes a 2X Champion. Your preparation and year round training have proven to be the best radio flyer rider. Thank you Battlefield and all who gave to this cause - all donated will go to Project ASK. Join the Club – Membership drive!!!!! If anyone is interested in joining the FBLA club please get a membership form from any Business teacher or you can download it from the FBLA school fusion web page (above). We are Simply the Best…… better then all the rest! Project Ask – Virginia FBLA‐PBL’s State Service Project is Project ASK, the Association for the Support of Children of Cancer. Since 1982, the Virginia Chapters of the Future Business Leaders of America (FBLA) have supported ASK as their State Service Project. Each fall, the 11 regions of the FBLA collect donations of gift cards, gas cards, treasure chest toys, snacks and supplies to help the children of ASK.